We all use minced beef but, for some unfathomable reason, minced pork hardly gets a look-in. It should do because it’s as useful as beef – good for sausage meat, meatballs, pâté, ragù and pasta sauces as well as a whole host of Asian dishes. 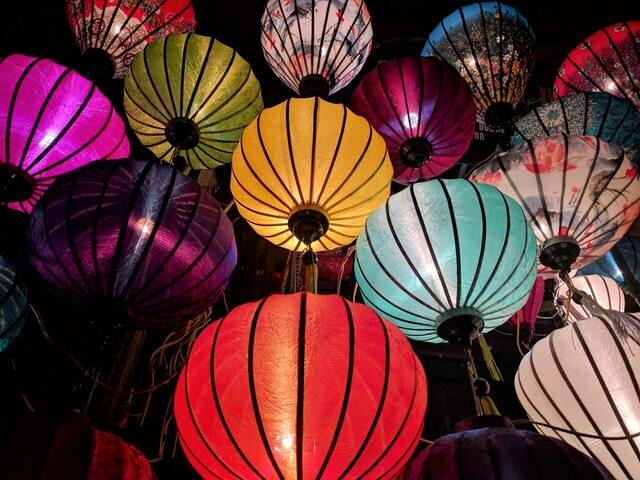 As the Chinese New Year festivities kick off at the end of next week we thought we’d celebrate with some Asian themed recipes. Like beef mince the quality can vary wildly, but as with our sausages our minced pork comes from proper, lean cuts of meat – mainly from the shoulder but also from the leg and belly. Absolutely no nasties. 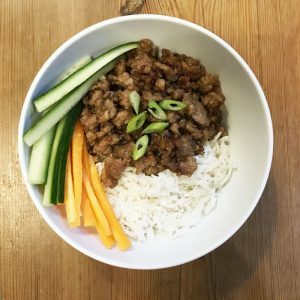 What’s good with minced pork? It’s fairly neutral flavour wise so it lends itself to strong additions, particularly of South East Asian origin. 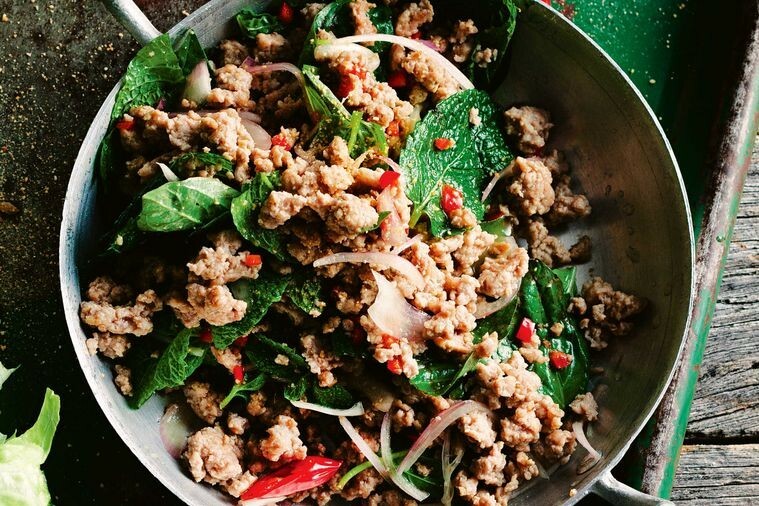 You’ll find loads of minced pork with kimchi recipes. Bizarrely, if you’re making meatballs, tofu makes a good binder and padding. To drink I’d probably go for one of Barnaby’s Pilsners but The Paddler Riesling (£10.75) or Adobe Gewürztraminer (£9.75) will also work. Alternatively a big meaty Malbec like our Famiglia Bianchi`, Caligiore or Bousquet would be an entirely different, but equally satisfactory match. For the prep, we have Squid Brand Fish Sauce and Season Pioneers Shrimp Paste, our own sweet chilli sauce, Essential soya sauce, Dragonfly firm tofu, and, until ours is ready, various Laurie’s Kimchi and Krauts. If Asian isn’t for you, they use a lot of minced pork in Italy – in meatballs and pasta sauces. Ex farm shop butcher John Read, whose partner hailed from Bologna, swore that the best Bolognese ragù was made using minced pork. Our favourite ‘Slow cooked sausage meat sauce’ is based on the classic pork, fennel, garlic and chilli combo. For a taste that’s even closer to home, mix with a few breadcrumbs, salt and a pinch each of mace and black pepper and low and behold you have sausage meat with scotch eggs, sausage rolls and various patties and burgers just a few steps away. It takes a lot to beat a good Scotch egg but as it’s New Year for the Chinese diaspora, here are some suggestions with an oriental theme. Thai salad with a classic sweet-sour-salty-hot flavour profile. Also called larb or laap, the balance of freshness, crunch and spiciness really works on a crisp lettuce leaf with a mango salad. Selection of: little gem lettuce leaves, blanched French beans, radish, fennel etc. And a sprinkling of chopped roasted peanuts or cashews to serve. Toasting the rice is a separate process – see how to do it here, or buy it from an Asian supermarket. Heat half the oil in a wok over a high heat until nearly smoking. 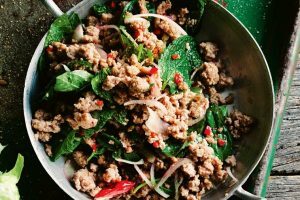 Add half the pork mince, the lemon grass and chilli and stir-fry, breaking up any lumps, for 3-4 minutes or until the pork changes colour. Transfer to a bowl. Repeat, reheating the wok between batches. Set aside for 15 minutes to cool slightly. Whisk the lime juice, fish sauce, sweet chilli sauce and lime rind together in a bowl until well combined and then spoon over the pork mixture. Add the onion, coriander, ground toasted rice and mint and stir to combine. Spoon the pork mixture among salad veg and sprinkle with the toasted nuts to serve. Heat the oil in a large frying pan over high heat. Add the onion, ginger, garlic and chilli and cook for 2 minutes. Add the pork mince and cook for 3 minutes or so until white all over, breaking up the meat with a wooden spoon. Add the sugar and fish sauce. Stir, then leave it to cook without touching until all the juices cook out and the pork starts to caramelise – about 2 minutes. Then stir it and leave it again, without stirring, for around 30 seconds to caramelise. Repeat. Serve over rice or vermicelli noodles, garnished with sliced spring onions/shallots and shredded iceberg lettuce, cucumber and carrots. Meatballs with a vermicelli mane are a classic Shanghai dish. Traditionally they tend to be big, but I prefer them as smaller meatballs with more vegetables and broth as a soup. The tofu works as a high protein binder, instead of breadcrumbs. Slice and dry the tofu with a kitchen towel. Transfer tofu slices to a bowl and using a fork, mash it into fine pieces. 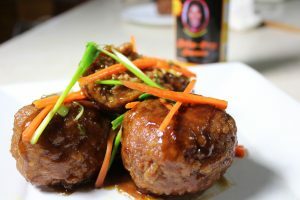 In a large bowl, combine the minced pork, mashed tofu, diced water chestnuts, minced ginger, finely chopped spring onions, egg yolk, sugar, rice wine, salt, half the garlic, ½ teaspoon white pepper and 2 tablespoons soy sauce, and gently mix until well combined, being careful not to over-mix. Refrigerate for 30 minutes. Working with wet hands, form small handfuls of the meatball mixture into small balls. Heat oil over medium-high heat in a non-stick pan. Working in batches to avoid overcrowding the pan, fry the meatballs until golden brown, about 3 minutes. Keep them on the move so cooking is reasonably even. Transfer them to a large paper towel-lined plate. In a bowl combine chicken stock, sweet chilli sauce, remaining white pepper and garlic and 1 tablespoon soy sauce. Mix well and set aside. In a large pan, heat the remaining 1 teaspoon oil over medium heat. Add stalks and stems from the bok choy and Chinese leaves. Season with salt and cook for 3 minutes. Arrange meatballs in the pot in a single layer, pour the chicken stock mixture in, and bring to a simmer. Cover and reduce heat to medium low. Cook until meatballs are cooked through, about 10 minutes. Meanwhile, soak vermicelli noodles in warm water until softened, about 5 minutes. Drain well and stir, together with the leafy parts of the bok choy and Chinese leaves, into the pot. Cover and simmer for 10 minutes longer. Sprinkle the remaining sliced green part of the spring onion and serve with white rice or as suggested, let down with a little more liquid and serve as a soup.